It was truly an Honor for Unique Moments Photography to capture the first big wedding at the Olalla Vineyard and Winery in Olalla Washington. This was over 100 in attendance. Aubrey and Chad contacted us and we jumped at the chance to work with this couple at this gem of a facility in the Gig Harbor Olalla area. 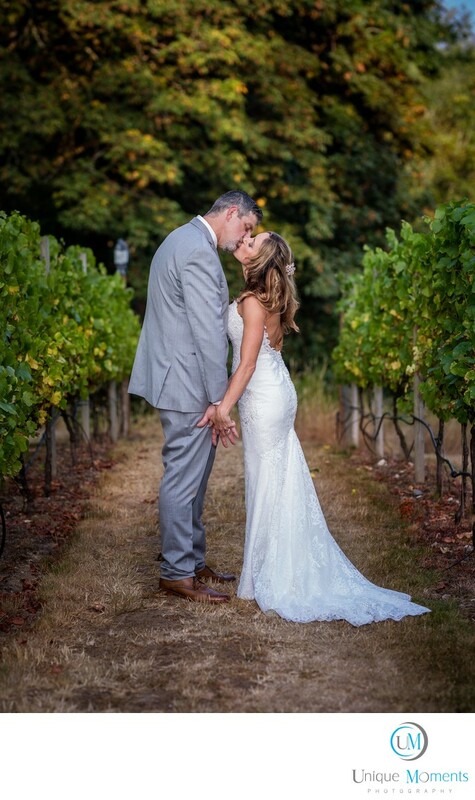 We have known about Olalla Winery for a couple of years as we have watched the owners develop the venue from a simple tasting room to a happening place in the area that features great wines, outstanding artists, Musicians and Now of course a top notch wedding center. This is the areas only winery and they host some unique and featured wines in addition to having a great wedding set up. I spoke to the owners about the potential of the venue to host unique weddings for families the previous year. We would guess that about 80-90 people attended this wedding and the venue and staff and guests loved everything about this awesome wedding and facility. Truly a wonderful unique venue that the valley is lucky to have. Family and friends were treated to a wonderful meal and soon after, the reception activities began. Speeches by the best man and maid of honor, Pie cutting, first dances by the bride and groom, a dance with the groom and his mother, and an honorable brother that stepped in for our brides father who passed away earlier in the year. His presence was felt by everyone during the father daughter dance. Simply remarkable. This wedding was special from start to finish and one of our favorites of the 2018 season. The Olalla winery is a place to strongly consider if you want a smaller more intimate type wedding. Having a European winery feel to it is simply a bonus for everyone who gets to visit this facility. We Highly recommend this venue and hope others will contact the owners for available wedding dates for 2019. We would love to capture another one. Congratulations to our happy couple. This was a home run from start to finish and we had a blast.